‘Walking For Lions’ starts tomorrow!! WOW, the Walking For Lions walk starts tomorrow! 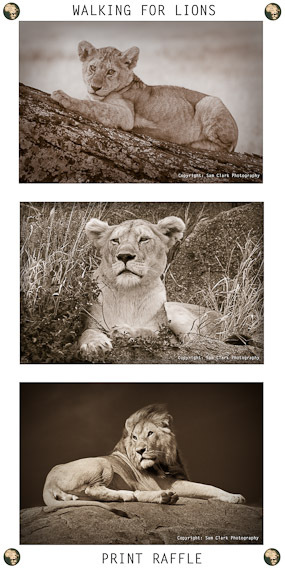 My print raffle is still running, so if you would like to be in with a chance to win three 8×12 inch fine art Lion prints as seen below, while donating to a very worthwhile cause to save our last wild lions of Africa, then what are you waiting for!! Just $5 puts you in the draw. Larger donations are always welcome, I will enter you once for every $5 donated. Please follow this link to donate, its as easy as 1, 2, 3!